“The Mad Voyage of Prince Malock,” “The Return of Prince Malock,” and “The Activist, or the Snake’s Chuckle” on sale at DriveThruFiction this week only! That means you can get The Mad Voyage of Prince Malock for $5.35 (normally $7.99), The Return of Prince Malock for $4.68 (normally $6.99), and The Activist, or the Snake’s Chuckle for $3.34 (normally $4.99). Remember, this sale is for this week only, so if you want to get any of the above books for these low prices, click the links above and buy them right away! Last day to buy “The Mad Voyage of Prince Malock” for $3.99 and £3.08 on Amazon US/UK! 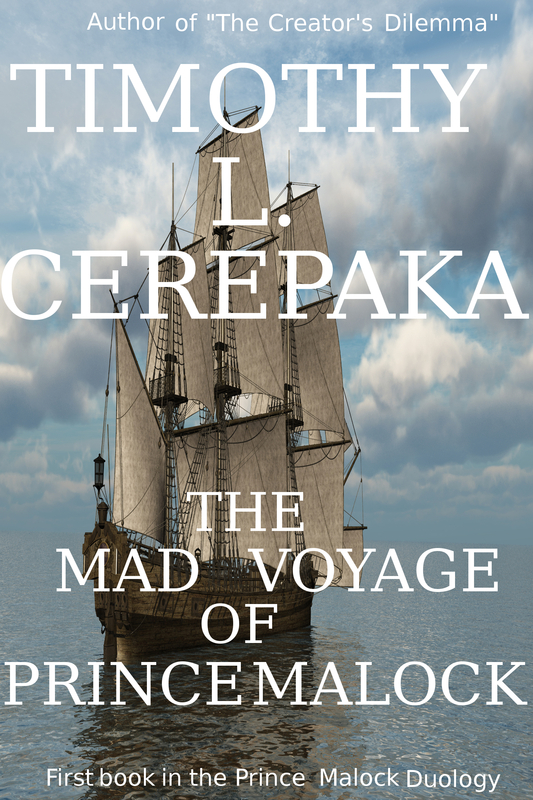 This is the last day of the half-off sale of my novel, The Mad Voyage of Prince Malock. Starting tomorrow, it will return to its original price of $7.99 USD and £4.99 on Amazon US and Amazon UK. As I said before, this is the last sale I will be running for the rest of 2014, so you won’t see this novel or any of my other books at this low a price again until at least early 2015. So if you’ve been waiting to get it while it’s on sale, I highly suggest you do so now. The sale, sadly enough, is already over on Libiro, but that doesn’t mean you can’t still buy it. It will just be more expensive is all, although I should note that Libiro has mobi, ePub, and PDF versions of the novel, in case you happen to like a different file format from Amazon’s mobi or don’t own a Kindle or something like that. For those of you who may not know, Amazon and book publisher Hachette have been in a pretty public and major dispute over how much Amazon is allowed to price Hachette’s ebooks. From what I understand, Hachette wants higher ebook prices ($9.99+), while Amazon wants to price them lower (less than $9.99). This dispute has been going on for a while now and doesn’t appear to be ending any time soon. In the beginning I eagerly followed every update about the dispute I could find. I did this because I believe it is part of my job, as an indie writer/publisher, to keep as up to date on news about the publishing industry as I can. I don’t want to be taken by surprise by some sudden or unexpected change, after all, the way some publishers and writers have in the past. But recently I’ve been avoiding almost every article written on the subject, even if it is written by someone I like. Why? Because the dispute has nothing to do with me*. I could honestly care less about who ‘wins’ because neither side’s victory or loss is going to affect me in any way. I am certainly not going to raise or lower the prices of my books in response to whatever happens. If I were a Hachette author or Amazon worker I might care, but I am neither, so I have no reason to give a hoot about which way the conflict goes. Basically I just think there’s more drama surrounding this conflict than it deserves. I was especially disappointed when Stephen Colbert weighed in on it a while ago, not helped in the least by his misunderstanding the whole situation. I think that was the point when I just got fed up with it. If Amazon and Hachette do come to some sort of agreement soon, I’ll definitely read about it. But I’m honestly not holding my breath and definitely won’t be altering my own plans in reaction to whatever agreement they come up with. Now if you will excuse me, I have to return to writing my next novel, which does concern me and therefore deserves my attention. *Dean Wesley Smith wrote a good blog post about it back in July that reflects my own attitude toward the dispute quite well. Tomorrow I will be out of town for about a week. I may or may not have Internet access in that time, but even if I do, I probably won’t spend much time online. So if I don’t update this blog for another week, don’t worry, I haven’t vanished off the face of the earth or anything like that. Just thought y’all should know. Also, I am pleased to announce that I have finished editing my upcoming dark fantasy novel, The Mad Voyage of Prince Malock. I am currently awaiting my first readers’ comments on it (already heard back from one of them, but the other two still haven’t gotten back to me yet). After that, I will get it copyedited, formatted, finalize the cover, and then publish it on as many ebook sites as I can (Amazon, Kobo, B&N, etc.). Assuming nothing goes wrong, The Mad Voyage of Prince Malock should be available on all major ebook websites before the end of June. If you want to be the first to know when it’s out, please subscribe to my newsletter here. You’ll also be updated on all my future releases, so if you’re interested, just click that link. You may have noticed that I have been blogging far less often than usual recently. Days can go between blog posts and I don’t always write substantive articles, either. That’s because I’ve recently started to teach myself ebook formatting, as well as cover design. Not only that, but I’ve increased my writing time from two hours a day to four in order to produce more work and finish my novel, The Mad Voyage of Prince Malock, quicker. All of this takes up a lot of my time, rarely leaving me enough time to blog. Because I want to be a career writer, I figure it would do more for my career if I spent less time on this blog and more time writing (or formatting or doing cover design, etc.). Doesn’t mean I have abandoned this blog. It just means I am putting my priorities in order and I realized that blogging was less important and less helpful for me as a writer than, say, writing my novel or making covers for my books, for example. I’ll still try to update this blog a couple of times a week, but probably no more than that, I’m afraid. Just thought I’d let y’all know. I’ve recently came up with an idea for a project I want to work on very soon, but in order to start it, I need to read at least seven novels that feature at least one character (not necessarily the protagonist, though that would be preferable) who struggle to retain belief in God. Any novel from any genre is appropriate and they can be old or new. Self-published, traditional published, and indie published novels are all acceptable, too, as are ebooks and print books. I don’t care who the author is, either. The only other limitation I must add is that the novels must be written in English (it’s the only language I can read well, though I can read a little bit of Spanish). You can even recommend your own novel, if you want. As long as the novel features at least one character who struggles to retain belief in God (the resolution to that struggle is irrelevant), I’ll read it.